So, I’m coming back. For one weekend only. To see familiar faces & take some photos. And I CAN’T WAIT TO SEE YOU! Clients that requested advance notice booked ALMOST ALL OF THE SESSIONS! Only 3 remain so contact me ASAP to reserve yours! I’m offering two locations this year. 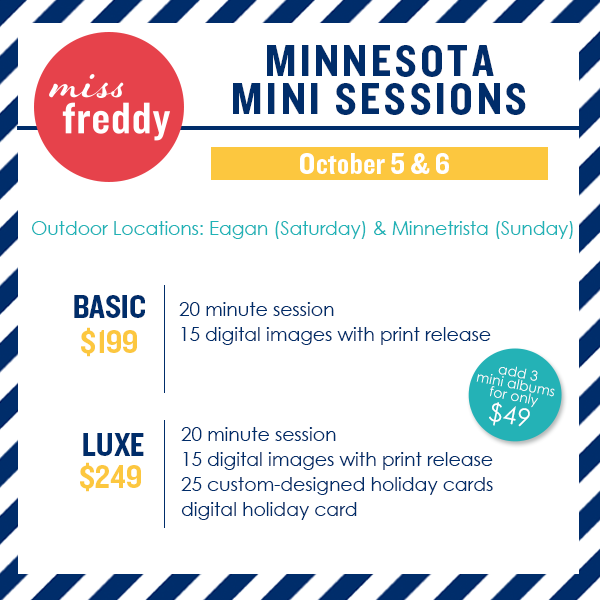 On Saturday, a beautiful woodsy location in Eagan. And on Sunday, a lakefront property in Minnetrista [it’s about 40 minutes outside of Minneapolis though so it may not work for everyone]. Here’s a quick photo from each location [radio flyer sold separately]. I’m also excited to offer an add-on this year of three miniature albums for $49– my FAVORITE item! These little guys make the PERFECT holiday gift for grandparents! A great purse or desk accessory! And don’t forget… when winter hits, you know you’re always invited to visit Miss Freddy in Seattle.